As the alternative of the traditional reflective road studs, the solar road stud has served on the roads for decades of years, and it is also known as cat eyes. The cat eyes are invented around 1930s by Yorkshireman, Percy Shaw, who has taken inspiration from the reflection of his car’s own light in the eyes of his pet. The solar road stud can absorb sunlight and change it into electrical energy, which is stored inside the battery of the road stud. 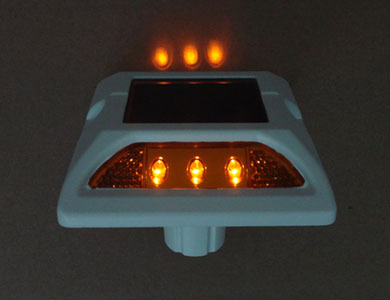 The solar road stud can work effectively at night without external power. The solar road stud is indestructible, for it is made by aluminum alloy and poly carbonate. 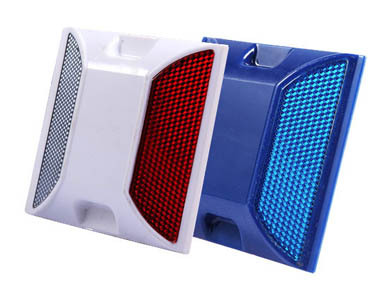 The LEDs on the solar road studs give out light, which is quite bright, and the high-quality retroreflective materials are applied on the surface of the road studs to guarantee good visibility at night or on adverse weathers. The application of the solar road stud can decrease the stress for drivers when they drive on the roads, for they can see further and know the road condition in advance, which has reduce the happening rate of traffic accidents effectively. For the temperature range of the solar road studs is wide, which can be -25 to 75℃, they can eb applied in almost all corners of the world. For some of the solar road studs are installed in the center of the roads, their pressure resistance must meet the standard. The products of NOKIN can withstand the load of over 20 tons. The high-efficient solar panels are equipped to the solar road stud, and he power consumption of each is relatively quite small, so the solar road stud can work for several days after fully charged. NOKIN TRAFFIC FACILITY can provide you with high-quality solar road studs with the most advanced technology. It is a professional solar products manufacturer and supplier who works in this field for over 16 year, and the factory of NOKIN locates in Shenzhen, China. Other solar products, like solar road signs and solar street lights are also provided.